Celebrating the life of Rayford Windom, Jr.
Be the first to share your favorite memory, photo or story of Rayford. This memorial page is dedicated for family, friends and future generations to celebrate the life of their loved one. Obituary for Rayford Windom, Jr.
Rayford Windom, Jr. of Bremen passed away Saturday, November 17, 2018 in a local health facility. He was born July 23, 1941 in Bremen, son of the late Rayford Windom and Ruth Durham. Mr. Windom was retired as a Maintenance Supervisor from Printed Fabrics in Carrollton. 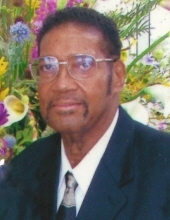 He was a member of Antioch Baptist Church serving as Treasurer of the Deacon Board and a member of the Male Chorus. In addition to his parents, he was preceded in death by his wife, Jeneil Cosby Windom; a son, Jeffery Lamar Windom; a granddaughter, Ciarra Cash; a brother, Jerry Luke and a sister, Maybell Billings. Survivors include his daughters, Kim (Tarance) Hawk, Kay Ross, son, Terance (Santiba) Windom; six grandchildren, Faith Cash, Ethan Cash, Isaac Hogg, Savannah Ross, Tamya Windom, Taylar Windom; six great grandchildren, Paris Cash, Nazeel Mitchell, Sahmad Mitchell, Arianna Cash, Ethan R. Cash, Jr. Safari Cash and a brother, William Luke. The family will receive friends at the funeral home Friday from 5:00 until 8:00 PM. Services will be Saturday, November 24 at 1:00 PM at the Antioch Baptist Church with Pastor James Burr officiating. The Deacon Board will serve as pallbearers. Interment will follow in Antioch Baptist Church Cemetery. To plant a tree in memory of Rayford Windom, Jr., please visit our Tribute Store. "Email Address" would like to share the life celebration of Rayford Windom, Jr.. Click on the "link" to go to share a favorite memory or leave a condolence message for the family.